The Aardwolf Forklift Boom FB-1 is a forklift attachment made from high-grade Australian rectangular tube steel, AS1163-450 LO, which ensures strength, reliability and safety. The FB-1 is the smaller of forklift booms Ardwolf offers and has the lifting capacity over 3,000 pounds and over a 1,000 pounds fully extended. 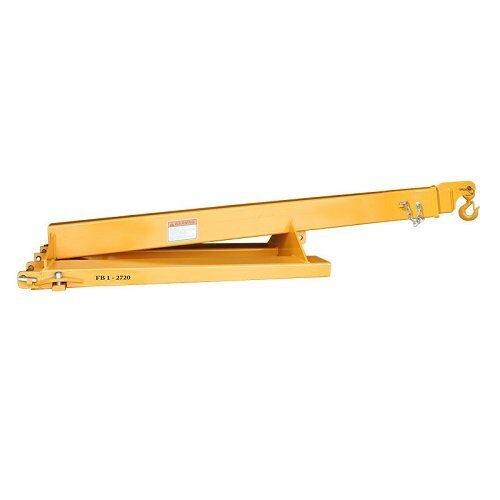 The Aardwolf forklift booms compliment the patented range of Aardwolf lifting clamps. The Forklift Boom FB1-2720 is a telescoping two-section rectangular tube steel boom for use on 2 ton and 2.5 ton forklift trucks. It offers versatility with maximum visibility for the driver. Air Scissor Lift - BAIR-D Series; Construction: Steel; Platform Size (W x L): 19-3/4" x 32-1/2"; Capacity (LBS): 1,000; Service Range: 15-3/4" to 35-1/2"; Caster Size: 5" x 1-1/2"
Air Scissor Lift - BAIR-D Series; Construction: Steel; Platform Size (W x L): 20" x 35-1/2"; Capacity (LBS): 800; Service Range: 13-3/4" to 51"; Caster Size: 5" x 1-1/2"
Air Scissor Lift - BAIR-D Series; Construction: Steel; Platform Size (W x L): 20"x 39-1/2"; Capacity (LBS): 1,750; Service Range: 14-1/4" to 39-1/2"; Caster Size: 6" x 2"